So, after about six months of unintended hiatus (! 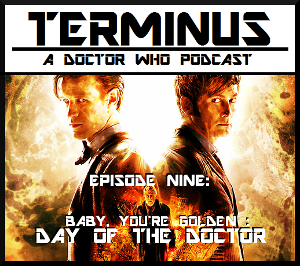 ), the ninth episode of 'Terminus' is now finally finished and available for you! So, life sort of got on top of me during that time, derailing me completely and utterly, but I'm back to give things another go with a belated review of the 50th anniversary story, 'The Day of the Doctor' (I've postponed the promised 'Silver Nemesis' review episode for later, since I'm shuffling my schedule around a bit to accommodate the hiatus). Anyway, many apologies for the wait and many thank-yous to those who've been listening all this time and cheering me on to return to my podcast again. Hopefully, things will balance out soon again on this end and I can bring you more content, more frequently. Anyway, as I said above, join me on this episode as I chat about 'The Day of the Doctor' and even get a bit saucy and naughty at times, but that's what recording at 3:00 AM will do for you. I hope no one minds too much, but I thought I'd give a warning, nonetheless. 0:06:31 - Happy Fandom Time! 1:05:58 - Coming soon on the next episode! Anyway, join me on this episode as I chat about 'The Five Doctors'. Also I chat about the new Second Doctor episodes found (yes, this episode was recorded that long ago! ), the 'Day of the Doctor' teaser trailer, some local 'Day of the Doctor' celebratory stuff, and other things making me happy in fandom right now. Oh, and apparently every time I refer to the Big Finish audio 'An Earthly Child' in this episode, I sound like I'm saying 'Unearthly Child', which is a bit funny. Oops! Sorry about that! I hope I don't confuse you too-too much! So, anyway, as always, glad to have you aboard and enjoy the ride! 0:04:17 - Happy Fandom Time! 0:15:14 - Geeking about 'The Five Doctors'. LIKE A BOSS. 1:12:16 - Coming soon on the next episode! + New Second Doctors stories found! The press release on Outpost Skaro! Phillip Morris on finding the episodes! + 50th Anniversary Teaser trailer on Youtube & two of the trailer breakdowns, here via Blogtor Who and here on Youtube by user votesaxon07! + UNIT 50th anniversary party in Atlanta! + Atlanta Gallifreyans 50th anniversary party and meet-up! + The Big Finish celebratory story 'Light at the End'! Derek Landy talking about writing his book here! + Lovarzi's New Official Replica Fourth Doctor Scarf from Season 18! Buy it here! + 'Five Doctors' fan trailer, made by Youtube user VERITASERUMUK. + The 'Terrible Zodin' Fanzine! Terminus Podcast -- Episode 4: In Defense Of + Greetings to Our New Scottish Overlord! 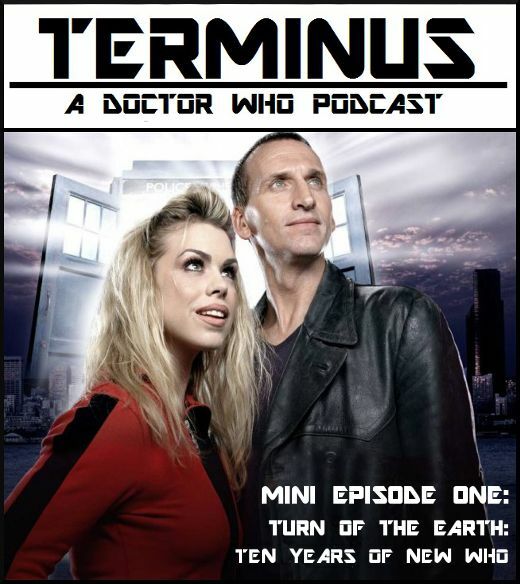 On this super-duper-late fourth episode of the Terminus podcast, join me as I chat about the recent reveal of who will be the next Doctor (on which there's lots of geeking and cheering from me, of course!) and how one of my favorite classic Doctors is coming to a convention near me next year (and I'll hopefully get to meet him for the first time!). Of course, as promised, there's also the main 'In Defense Of' segments, where I come to the defense of several characters and other bits of fandom I think are often ridiculed unfairly. Admittedly, I sadly didn't have the nicest things to say about Rose Tyler a few times in the episode and while I know she's a bit of a sacred cow in fandom, I feel that many of the characters I talked about were often sacrificed at her altar and put up against her in comparison by the show. So, I argue how those comparisons failed for me. I'm honestly hoping I don't lose any listeners over that, because I know YMMV and everyone gets something different out of different characters, but at the same time, I had to be honest with my opinions. Anyway, this is the longest episode I've done so far, which probably made the timing of it even worse as its running so late due to Life Stuff (I sincerely hope to be back on schedule going forward though). So, anyway, enjoy the ride -- its a bumpy one this month! 0:04:38 - Happy Fandom Time! 0:59:02 - Coming soon on the next episode! On the second episode of the Terminus podcast, join me as I chat about the Eleventh Doctor and my feelings about his character and story arc so far. I also discuss my thoughts on his impending regeneration and there's the intro of the newest reoccurring show component -- Happy Fandom Time! -- where I discuss what I'm currently geeking about in the world of Doctor Who. Along the way, there's also bonus sound issues I had to contend with and edit as best as possible (a plethora of clipped words and distortion, oh my! ), my cat Fender making loud sounds in the background from the next room (she apparently wanted her own opinions of the Doctor known -- does anyone speak Cat? ), and the occasional rant about the Tenth Doctor era (which, wow, not sure I was so ranty-pants that night -- I do like him, I swear!). Enjoy the ride (it is a bumpier one this time, but the seatbelts are quite comfy)! 0:03:23 - Happy Fandom Time! 0:04:52 - Geeking about the Eleventh Doctor. Lots. With bonus comparing and contrasting with the previous Tenth Doctor era, which I'm not sure I'm proud of.